With nearly 30 years in the construction and handyman trades, there's little that "Dan the Handyman" can't handle. Ï do just about everything related to home services and maintenance, "says Dan Noar, who helps residents throughout Sonoma County. "I do an awful lot of plumbing. You name it." He also provides painting and interior and exterior carpentry services and will install everything from smoke detectors and ceiling fans to kitchen appliances. Noar tackles projects of all sizes, from hanging photos to setting up children's swing sets. No two weeks are the same. One day he's cleaning and repairing gutters, the next he's clearing out garages and making dump runs. "If I put a job in my schedule," he says, "it happens." 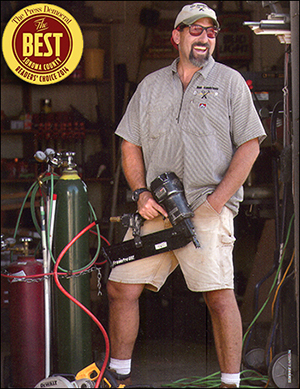 Best Handyman: Dan Noar, was voted by readers as the go-to repairman in the county.